Since the birth of abstraction, and with that the notion of autonomy in art, figuration in sculpture has always been a problematic area, particularly in relation to the human form. Even when it was liberated from that burden during the latter half of last century, it was still very much a taboo to pick up a lump of stone and release a human form from its midst. Particularly if an artist was to have any aspiration to be seen as contemporary and cutting edge, whatever that term might qualify. Today the coding of materials and the language of the media has quite rightly become acknowledged as a given in the business of making art out of stuff. Arguably stuff can never be neutral or passive in the eye of the informed viewer, whether seen through the lens of the modern and the notion of ‘truth’ or the post modern counterpoint of the playground for cultural connotations and contextually contingent agents. Plensa has many works in this epic show at YSP and uses a range of strategies to explore notions of the self, the soul and our constitution within language. All pretty substantive works in terms of form, media and association. This is a big show with a hell of a lot of to go at and in my opinion easily a full days worth. But for me there is one particular work which is truly remarkable and outstanding on show, not just amongst Plensa’s own body but amongst the wider cannon of sculpture today. For a sculptor to take the form of human bust, with all its classically loaded baggage and then depict it in a material like alabaster, itself full of historic association with sculpture of a bye-gone times is likely to be a problem. To add children into the mix, whilst leaving out even the slightest pinch irony, would in nearly every other imaginable case result in a body of work that wallows hopelessly the a mire of naff sentimentality. Perhaps it is these very areas of dangerously thin ice that when successfully traversed can result in work of truly dynamic charge. Perhaps it the the fact that that Jaume Plensa demonstrates his ability to skate so precariously on the edge of utter triteness is what makes his work all the more special. And I would argue it is his ability to takes all these elements and re-mix them so effectively that elevates that which could be so potentially banal into an outstanding work of contemporary significance. 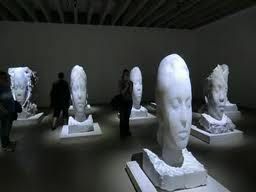 Plensa has filled one of the rooms at YSP with a series of carved alabaster children’s heads, each facing forwards. Some 6ft high, they appear like holograms in the immaculately lit chamber. They have a vertically stretched appearance as if incorrectly re-sized in photoshop and it is this bizarre digital and futuristic quality in combination with the sense that as a viewer you are immersed in a cinematic landscape that gives the work such an evocative charge. The children’s eyes are closed and they appear half asleep, possibly comatose, possibly dead. Already this work is firing on many syntactical cylinders. Once you add in the overarching sense of time and the issue of classical sculpture as coded through the naturalism and the alabaster itself, plus the knowing reference to direct carving though the rough hewn block remainders. You have to an incredibly rich mix of strands upon which to base reflection and contemplation. More than plenty to go at in terms of extrapolating meaning. But that said, for me all this should be a given in any quality art experience. You still need the other bit. Without the other bit, viewing can all too easily be an academic exercise in deconstruction. Onto then this other bit and it really is the ‘other’ bit. The fact was I simply didn’t want to leave the room. I was unashamedly transfixed and moved. It catalysed a plethora of lifting emotions and transported me somewhere else, somewhere good. It was to paraphrase the song ‘itchycoo park’ a whole too beautiful. The complexity, sophistication and execution and other many parts were all there to unpick, there for the eye to see, but it was subsumed into this stunning, visual and perceptual entity that was sung with an over arching subtle harmony. It is one of those shows you keep telling others to go and see. And if it does half for you what it did for me it’ll be well worth the effort.